Dr. James T. Enns is a graduate of the University of Winnipeg and Princeton University. A central theme of his research is the role of attention in human vision. 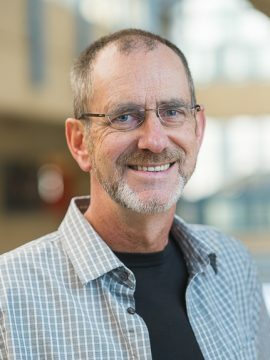 He has served as Editor for the Journal of Experimental Psychology: Human Perception and Performance, and has served as Associate Editor for Psychological Science, Consciousness and Cognition, and Visual Cognition. His research has been supported by grants from NSERC, the Canadian Foundation for Innovation, the Australian Research Council, BC Health & Nissan. He has authored textbooks on perception, edited two research volumes on the Development of Attention, and published numerous scientific articles on vision, attention and cognitive science. Research interests include perception, attention, vision, cognition, development, human-machine interaction. For a list of publications visit, Google Scholar. Dr. Enns is currently accepting graduate students.